Fruitless Pursuits: Lego Minifigures Series 6 Is Out! Photos & Bar Code / Bump Code Decoder! I managed to score the Statue of Liberty (which I think is an awesome concept, although I still hate the "dress" piece) and also the Classic Alien. I really want the Wind Up Robot and Teddy Bear Kid. And I either overlooked it, or just never knew that it existed, but the Surgeon's x-ray is so cool. The Surgeon was not even close to a favorite before, but now that I have it, I love it. And thanks to Better Than Tomorrow and the unknown UK collector who shared it with him... here are the bar codes for Series 6! Good luck! I grabbed a couple of packets a week or so ago. I got the skater girl and was mortified, but the mechanic and mullet warrior I also got made up for it. There's a bunch of those that I TOTALLY want. A week or so ago!? Where are these?! What's going on!? Okay! I picked up six of these after work. 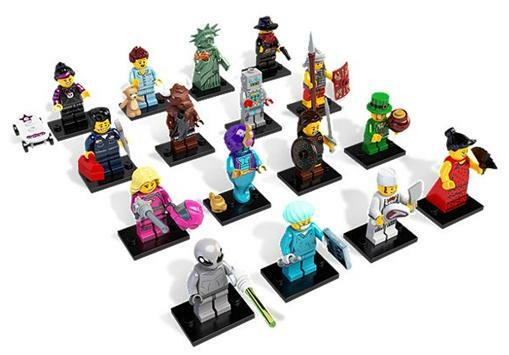 I got: Mullet Warrior, Lady Liberty, Skater Girl, Classic Alien, Cowboy Outlaw, and... a double of Lady Liberty. So Jacinta we should totally be swappin' in the future, yo! I think I got them from Big W, maybe last Friday. I have a few of the figs across three series, but I have NEVER HAD A DOUBLE. I think it's some kind of superpower. But I'd certainly take that Lady Liberty off your hands. I've been pretty lucky, but I've had my fair share of doubles. I don't mind, especially if they're an army builder type of figure. I also intentionally bought 4 of the mimes from a few series back. A mime army? D: Terrifying. I can now add a Leprechaun, Flamenco Dancer, Surgeon and Minotaur to my own haul. I have doubles of Flamenco and Mullet Warrior now too. I just spent about 20 minutes feeling up all of the packs and I was able to get the genie, robot and leprechaun. Has anyone been able to get the teddy bear kid yet? My dots weren't the same as yours :( I have a minotaur and a galactic girl and one was the same as galactic girl but the other was 1 dot on each side. I don't know which package was which though because my son mixed up the packages. I am after the Lady Liberty for my daughter collection. Will swap a Minotaur or other. Please email if you are interested in swapping. Have other doubles from previous Series. I got a double Galaxy Patrol from Series Seven!